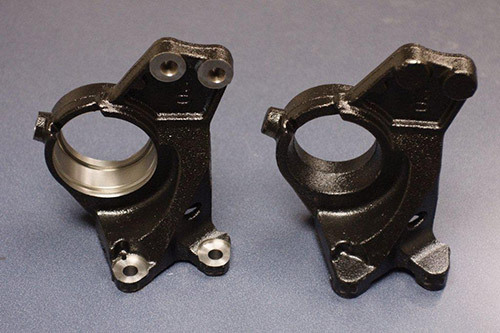 The product highlighted here is manufactured for use as an engine mount. The project specifications called for a high volume product with strength precision machining. Composed of D 5506 ductile iron, it measured 4.75" in length, 5" in width, and 6.5" in height. It also had to be manufactured to tolerances of ±0.0004". We chose to machine this part on our state of the art horizontal CNC machining centers. 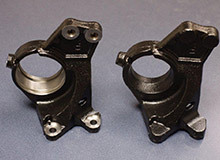 Multiple machining processes were applied including drilling, grooving, and tapping. Before the machining, each part had an e-coat applied, and after the machining, each part was deburred. In order to accommodate the customers production needs, we have developed a just in time (JIT) delivery schedule. This will provide the customer with deliveries when they are needed for production, decreasing their inventory and saving them precious floor space. To learn more about the process and methodology applied to this project, contact us directly. Overall Part Dimensions Length: 4.75"